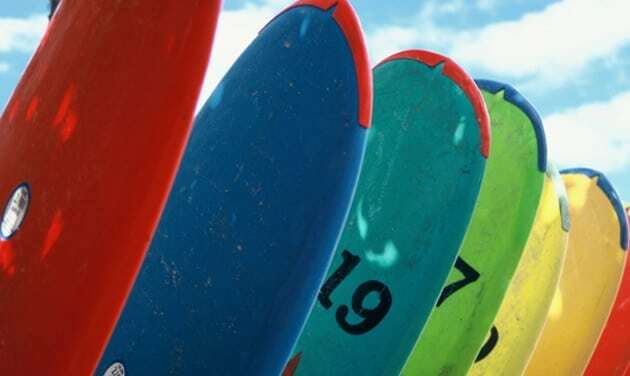 Great location and lots of fun, at Harlyn Bay in Cornwall we have surf lessons for all ages and abilities – named as ‘The No1 surf school on the North Cornish coast’ by the Sunday Times! Whether you want to learn to surf, or improve on your surfing skills, them come and meet our fantastic team of coaches who will be there to provide top quality instruction. Harlyn Surf School is one of the UK’s premier surf schools, and with over 24 years experience, we can probably claim to being the UK’s longest running surf school as well! We have an amazing location on what we think is one of the most beautiful and unspoilt beaches in Cornwall. Harlyn also happens to be one of the safest beaches on the North Cornish coast and is perfect to try a variety of watersports safely. That is why Harlyn has been voted as one of the top 5 beaches in the UK for activities and families! 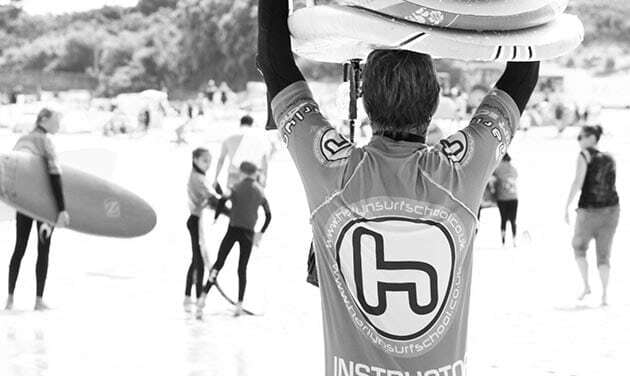 See our Surf School FAQ’s. We offer a great range of watersports equipment to hire from our beach unit. How often do your lessons run? We run lessons daily from 10 – 12 and 1.30 – 3.30. our 1hr kids fun sessions start times vary but they are generally from 12.15 to 1.1. we ask you to meet us 30 mins prior to your lesson start time so we can check you in and kit you out. Is all the equipment provided? Yes we provide brand new Alder wetsuits and a great range of surfboards. We work on a ratio of 1 instructor to 8 pupils although class sizes are often smaller. For our classes the ratio is 1:8 and for progressor it is 1:1 for our 5-7yr olds it is 1:4. Of course – If you really want to get to grips with surfing we recommend a series of lessons. You are never too good to stop learning! We specialise in taking young children from 5-7yrs old and our 1hr fun sessions are perfect for them. There is no max age just as long as you can put a wetsuit on and make it down to the water you are most welcome. From the first Monday in July and runs every week throughout July and August. At our beach cabin right on the beach at Harlyn Bay – Plenty of parking available. Towel, something to wear under your wetsuit, suncream and if you are also taking part in coasteering, sup or kayaking remember to bring a pair of trainers. I am part of a group with mixed ability – can we stay together? Yes for the most part – it is best to email us with your specific requirements, let us know age and ability range. What if the conditions are not appropriate for my lesson? Yes our instructors will have a drybag with them at the shoreline and it can be kept there. Please make sure you complete our medical declaration form and inform your instructor before your lesson starts if you have medical or physical concerns. If you have your own full length wetsuit and have booked a lesson in the summer months June to end of September you are most welcome. You can wear your own shorty wetsuit if kayaking or paddleboarding. You can use your own surfboard if you have booked our intermediate or progressor lessons. Rest assured Harlyn beach is one of the safest beaches on the North Cornish coast. It is lifeguard patrolled from Easter to the end of September. All of our instructors hold lifesaving qualifications and the surf school is accredited and regulated by a number of different bodies including Adventure Activities Licensing Service which ensures we operate to the highest standards.